I know that not everybody is having spring right now (hello my Australian friends ! ), even the ones who are supposed to have it (hello my American friends ! ), but I hope you will be inspired by this week's challenge : SPRING ! Spring photos, spring colors, spring embellishments... Show us what spring inspires you to do ! 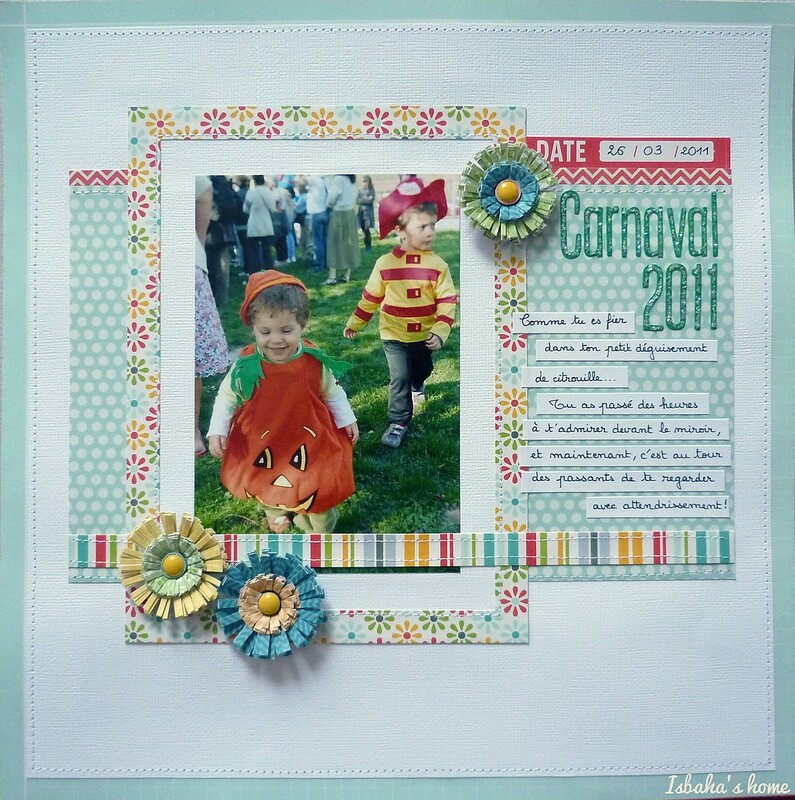 I chose this spring 2011 photo, with my disguised kids for Carnival, and because spring means to me flowers, I embellished my layout with homemade flowers. Spring is finally starting to happen around here. I never thought I would see my crocuses pop through, but they did finally. Anyway, I was inspired by the season and the beautiful flowers an colors. And since my brain has been in 'wedding mode' for a long time now, here is my layout ( apologize for the fuzzy upload). Today was the first day we have had that was actually nice and made us think that spring may actually show up this year after all! In my scrapping I am working on late summer/fall from 2010 (just a tad behind!) so I opted to do a card for this challenge. Spring to me means butterflies and pastels! I always enjoy seeing the DT Creations!! They are fantastic! Thanks for another fun challenge! Thank you so much, Susan !